GDF SUEZ has received 800 framework leaders for its Senior Executive Convetion 2011 at the Newport Bay Hotel in Marnes-la-Vallée. During three days, participants attended various meetings and thematics exhibitions. At the end of this convention all senior executive attended to the Trophies innovations' ceremony and an evening hosted by Michael Gregorio. ETC was asked to cast in images and broadcast the entire event, including an original mapping on the screen and a city rebuilt in the plenary hall to represent the GDF SUEZ energy mix and a consistent creation with the business plan "by people for people"
Installation of 8 x 20K lumens video projectors to map the set of 37 x 5.20 m.
Using 6 x 10K lumens video projectors for the direct and slides in HD on the info set. Vidéomapping ofthe city was carried out with a 10k lumens video projector. 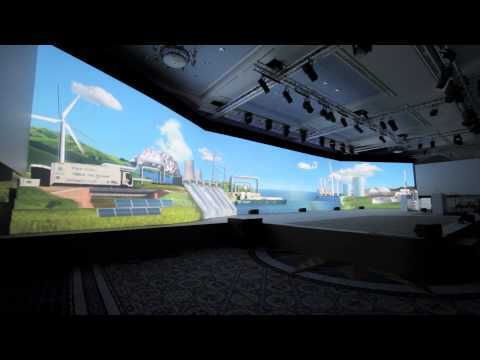 Four 10K lumens video projectors were used for the sides and back screens. For the evening in the Arena, 3 x 10K lumens video projectors have been installed to accompany the show in images and broadcast. For the trophy ceremony 2 x 10K lumens video projectors were installed in the "Dome". Deployment of a HD portable production unit with 5 cameras includind a turret on the plenary hall as a SD portable production unit with 3 cameras to the Dome and Arena. The encoding was performed with ETC’s control system, Onlyview, which allowed to diffuse animations, visual aids and the realization of the mapping.